Ants are social insect living in organized colonies. There are thousands of species of ants found all over the world and in just about every type of land environment. The science of studying ants is called myrmecology. The ants are one of the most successful groups of insects, they are of particular interest because they form advanced colonies. They belong to the order Hymenoptera. They always live in colonies (a colony is a group of related ants); some colonies have millions of ants in them..
Ants exhibit complex behaviour; some ants build intricate nests, some are fierce warriors, some collect and store seeds (harvester ants), some capture slaves, some live in symbiosis with plants and some farm fungi (leaf-cutter ants). Ants Many species of cacti (e.g. Coryphantha, Sclerocactus, Ferocactus, Tephrocactus etc.) produce nectar that feed the ants that live around their bases. This cacti are characterised by the presence of extra floral nectaries; they are glands typically located in the tubercle-grooves or in the axils (in the areole near the spine cluster) expecially around the flowers. These nectary-glands exude a viscous juice (nectar) with a high sugar-content. These glands represent a sophisticated strategy for ant attraction. A second reason is the nutrient enhancement. 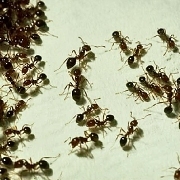 Ant colonies tend to concentrate nutrients in the immediate vicinity of their nests - through storing food, discarding debris, and defecating. Plants that bear extra floral nectar, attract ant nests to their base. As well the extra floral nectar might also serve to distract ants from foraging themselves at the floral nectaries, an adaptation to reduce ant visitation to flowers.